Since 1938, the Salvatore name has been synonymous with exceptional service and hospitality. 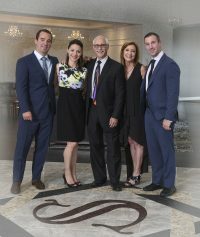 Four generation of Salvatore family pride go into each detail of your visit as our guest. Joseph, his wife Paula, and their three children proudly carry on the tradition that began with his grandfather’s restaurant on the east side of Buffalo in 1938. Italian | Prime At Salvatore’s, Salvatore’s Garden Place Hotel and The Delavan Hotel and Spa are perfect destinations for a romantic night out, a business dinner, or that special event that has to be perfect for your family and friends, and they proudly boast an award winning wine list with over 500 offerings from around the world.